Susan Hayward, Dean Martin, Wilfrid Hyde Whyte, Ralph Meeker, Martin Balsam. Ada is political soap opera of the very enjoyable melodramatic kind, set in the southern states of America. It is a Susan Hayward vehicle (originally intended for Elizabeth Taylor) but Susan Hayward give it the full treatment. She is a common woman who rises to great power and defies the political corruption of the state, especially embodied in Wilfrid Hyde White. Dean Martin is well cast as a singer who is caught up in the political career and the corruption. It might be compared with such serious films as All The King's Men and A Lion Is In The Streets, with echoes of Louisiana's Governor Huey Long. leading ladies to Oscars e.g. Anna Magnani in The Rose Tattoo, Shirley Booth in Come Back Little Sheba, Elizabeth Taylor in Butterfield 8. He had directed Susan Hayward very effectively in I'll Cry Tomorrow. Attractive in colour and Panavision, Ada is very interesting entertainment. 1. The appeal of this kind of film for women, for men? For American audience, non-American audience? Interest and entertainment? 2. The importance of colour, Panavision, music? The impact of the stars? 3. The quality of the political insight and satire of the film? The amount of 'bite' in it? How particularly American? The presentation of the campaigns, political tactics, the presentation of legislation, speeches and condemnations in the Assembly? 4. The character of Bo Gillis? The popular musical type, the credibility of his standing for public office? The amount of support that he got, the type of appeal that he had, for people who supported him? His official advisers and their political shrewdness, characters? The image that they were creating? A politician of the 1960s? How well was his personality illustrated, the values that he stood for? Dean Martin's suitability for this role? 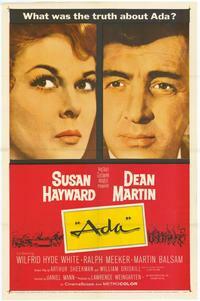 The contrast with Ada, Susan Hayward's performance? The strong woman, her callgirl background, the tough coping with life? How sympathetically was she presented at the beginning? Her attitude towards life and survival? 5. The credibility of the encounter between Ada and Bo? Ada's surroundings, sleaziness, Bo's fascination? His dependence on her and his courtship? Her reaction? The consent that they gave to the marriage? The possibility of building a future? 6. The portrayal of the character of Sylvester: the Southern American style, his political trickery, his money, his use of slander, the suicide of the opposition? The men he had around him to do his dirty work, his public appearance and benevolence? Colonel Yancey and his type? The type of political corruption presented in the character of Sylvester? The film's comment on it? 7. The use of power, corruption in elections? His use of office and puppet men? His dishonesty about land and public gardens etc., his manipulating of Bo? 8. The inadequacy of Bo in fulfilling his role as governor, his inability to cope, his easygoing nature? The impact of Wolfe and his importance, his house? His being the yes-man and signing the bills for Sylvester? 9. Ada's reaction to the change from rags to riches? Her sense of achievement, her ability to cope, her fighting with the society ladies? Her support of Bo, her suspicions of Sylvester, her dislike of Yancey? 10. The inevitability of clashes between herself and Bo? The build-up to the bomb in Bo's car and his narrow escape from death? His suspicions of Ada ? The sequences in the hospital and the hostility between them? Ada's reaction to this? 11. Her determination to fight Sylvester, the irony of her using him in the same way he used others, her leading him and her wiliness and techniques? The role of Yancey? The build-up to the fight in the public arena? 12. Comment on the dramatics of the clash between Ada and Sylvester, her revealing the truth, his investigation into her past, his intention to use the past against her and her beating him in tactics? The clash of power, her speech, Bo's arrival and his awareness of the truth? 13. What insight into characters of men and women, relationships?